had two half days and was home by noon. Noon? What's that all about? I can't get anything done by noon. 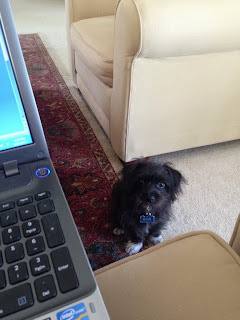 my normal writing routine--yes, and back to reality. In fact, it just so happens that I'm talking about FOUR THINGS I did to prepare myself for it over at the Heart-Shaped Glasses blog. Nothing earth-shattering, but I did need to prepare myself. there will be entered in a drawing for a $10 Amazon GC. Sox. I haven't talked about him in ages. He is a total sweetheart. He's doing really well, too. NO accidents in the house. NO chewing issues. He does like to dig. As a result, I have little divots all over the yard and when he does that he manages to get mud/dirt caked into his paws. That makes this Momma a very ANGRY MOMMA. Especially when this Momma is all dressed up and ready to go out to dinner. Oh, and I've found a new favorite TV show! Yes, it's reality TV about a family in the south who started a company making products for duck hunting and became very wealthy. At first, I just thought it was about a bunch of rednecks, but I really enjoy watching the family dynamics and their humor. Plus, it is one of the few popular reality shows that actually promotes good family values. Gee, imagine that? And that's all from me. Have a great week! writing routine or have you never left it? Have you watched Duck Dynasty? I love Duck Dynasty! It's funny and I like how they end every show in prayer around the dinner table. We never had half days when I was in school. Ever. Weird. The link I had for this post on Feedly went nowhere. Digging is bad, but chewing is worse. LOL. Count your blessings. I lost an entire leather furniture set when Iko was a puppy. Oy! Awwwwww Sox is adorable! Look at that sweet face! Awwww! Good luck with your writerly routine! And who knew there was money to be made hunting ducks?!?! Haven't seen Duck Dynasty but I have been writing. Finished Draft 2 of my first ever novel. Now I'm letting it sit awhile before revisiting for round 3. I have a digger on my hands too. Frustrating!!! You're the second person I've heard that loves Duck Dynasty. I'm curious now. I'll need to check it out! My dogs dig. It drives me crazy! I'm working on conference prep right now. Hopefully after conference I'll get back into my real writing routine. I think most of the world loves that Duck Dynasty show! Awww, Sox is so cute. I bet you can't stay mad long. I watch Big Brother--and it's really almost a sickness. I've watched all 15 seasons at least once--most twice. And yet somehow I feel compelled to start over again and watch all the seasons. I watch it while I'm writing, though, and I only halfway pay attention to it, so maybe I just see it as comforting for some reason! I've never seen Duck Dynasty, but I'll have to give it a try. As for digging, you can try setting a mouse trap but then turning it upside down in the hole. (Make sure the trap is upside down so his paws don't get hurt.) Sometimes just the noise of the trap snapping when the dog begins digging can be enough to get them to quit. I haven't seen that show yet, but have a girlfriend that loves it. Duck Dynasty is about to start down this end of the world. I'm going to have to watch a few episodes. Re the digging: what we did is build a little sandpit spot where our puppy is allowed to dig. We buried a bone there and that seemed to help. She occasionally slips and digs in the vegetable garden, but mostly her digging is confined to the sandpit. Another tip - if you put a little of their dog poop in the areas where they're digging, they tend not to dig there again. They suggested this at puppy school and it seems to work with our Bella. My husband is a huge Duck Dynasty fan. He likes to do Si (or however he spells his name) imitations! I saw a picture of Sox's digging adventures on Facebook. But I can't imagine that you could stay upset very long. I mean, just look at that cute face! 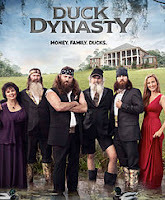 I haven't seen Duck Dynasty-but it does sound interesting!